The 2009 Roush Mustang comes in several carry-over upgrade packages and at least one new Roush Touring Coupe (RTC) limited special edition. Returning in 2009 is the Stage 3, 429R, Stage 3 Black Jack Limited Edition Mustang, and Stage 3 P-51A and Stage 3 P-51B 510hp limited edition. Dark Candy Apple Red 2009 Roush 429R Mustang coupe with Roush's four piece body kit (front fascia, front chin spoiler, hood scoop, and rear wing), Roush 18 inch chrome wheels with performance tires, Roush suspension system, Roush custom interior, Roush graphics and badging, and a RoushCharged 4.6L V8 engine rated at 435hp and 400ft-lbs of torque. 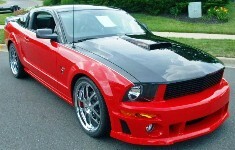 The 2009 Roush 429R Mustang is limited to a quantity of 100. Black 2009 Roush Black Jack limited edition Mustang convertible. Only 100 of these Mustangs will be built in 2009. Under the hood is a 430hp (400 ft-lbs of torque) Roushcharged 4.6L V8. The Blackjack includes a black seven piece aerobody kit (front fascia, front chin spoiler, hood scoop, rocker panels, rear fascia valance and rear wing), lower valance fog lamps, black bar high flow grille, 18 inch forged black wheels with high performance tires and performance brakes, Roush locking lug nuts, high performance exhaust with chrome tips, Stage 3 emblems, and Roush interior options. This is number 9 of 51 Vapor silver metallic 2009 Roush P-51A Mustang coupe which comes with the ROUSHcharged P-51 4.6L powertrain system and additional components which create 510hp and 510lb-ft of torque. These additional components include: TVS Technology ROUSHcharger, intake manifolds, intercooler & radiator, cold air induction system, secondary sheave FEAD (secondary drive belt assembly), forged Aluminum pistons, forged steel H-beam connecting rods, forged steel crankshaft, unique high flow fuel injectors (~52lb/hr), unique fuel rail, dual 60mm electronic throttle body, upgraded fuel system, aluminum flywheel, upgraded clutch, and ROUSH calibrated ECM. Vista Blue 2009 Roush Touring Coupe (RTC) Mustang with a blacked out top and hood, Roush 4-piece body kit, Roush blacked out 9 bar front grille, Roush 20 inch forged RR04 wheels, performance tires and brakes, Roush custom interior and dash, Roush suspension, and a ROUSHcharged 435hp 4.6L air induction V8. Vapor silver 2009 Roush P-51B supercharged Mustang coupe goes beyond the 2009 P-51A with Cooper RS3 ultra-high performance tires, new 18-inch black chrome rims and locking lug nuts, Roush 6-Piston brakes, and interior Roush boost vent pod gauge, and secondary drive belt assembly (secondary sheave FEAD). The P-51A and B has the ROUSHcharged P-51 4.6L powertrain system and additional components which create 510hp and 510lb-ft of torque. Both 2009 cars have the signature army green hood stripe, but only the P-51B has a color matching rear decklid emblem. Vista Blue 2009 Mustang Roush 429R coupe with a ROUSHcharged 435hp V8 engine, Roush 4 piece Aerobody Kit (front fascia, front chin spoiler, hood scoop, rear wing), lower valance fog lamps, high flow nine bar grille, rear quarter window louver panels, 18 inch Roush cast chrome wheels, Roush exhaust, Roush graphics and interior.